Neil Enterprises Govino Beer Glass. Plastic. BPA free. Reusable. Shatterproof. Recyclable. Hand wash only. Finger ridge on back. Black imprinted "Rose-Hulman" over "18 - R - 74" over "Engineers" over "Terre Haute, IN". 16oz. Neil Enterprises Govino Stemless Wine Glass. Plastic. BPA free. Reusable. Shatterproof. Recyclable. Hand wash only. Finger ridge on back. Silver "R" imprinted on front. 16oz. Grip the sturdy handle in the palm of your hand and cheers to the occasion with the Belgian 15 oz Mug. "Rose-Hulman" over "Institute of Technology" laser etched on the front. LXG gray 16 ounce bistro mug. "R" over "Rose-Hulman" over "Institute of Technology" etched on both sides. LXG Clay Glaze Mug in Color Tan. 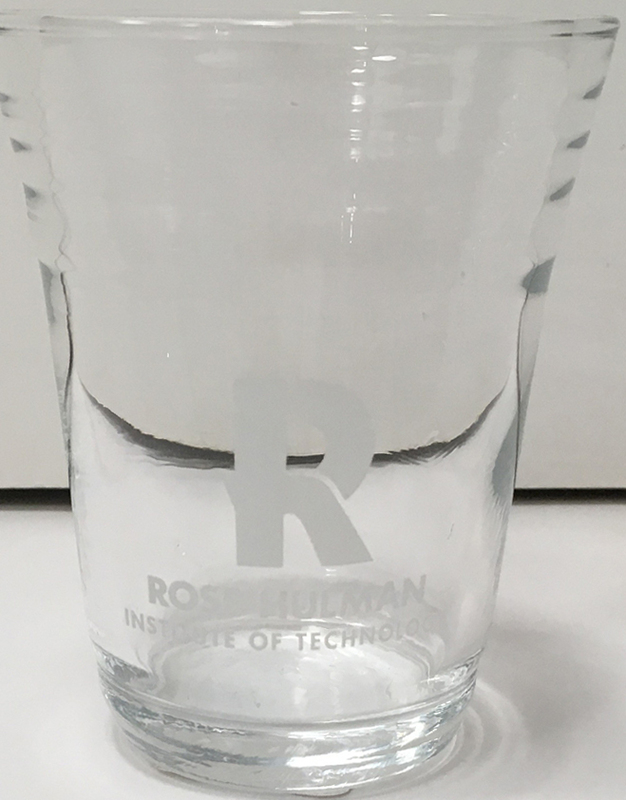 Engraved "R" logo over "Rose-Hulman" over "Insitute of Technology". LXG 16 oz. pilsner glass. Going sideways "Rose-Hulman" over "Institute of Technology"
LXG 16 oz red wine glass. "R" over "Rose-Hulman" over "Institute of Technology"
This 16 ounce white wine glass is great for casual sipping or for a formal occasion. The 16 ounce glass is designed to accentuate the aroma of white varietals suited or the contemporary wine connoisseur. Neil 15 ounce "woodsy" mug. Cardinal "R" over "Rose-Hulman" over "Institute of Technology" on both sides. Neil 5 ounce taster. "R" over "Rose-Hulman" over "Institute of Technology" frosted on one side.